Ah, Spring is here... Maybe not on the calendar but now that the Spring Training season has started it really seems a little brighter to me. The Phillies came out swinging for their first official Spring Training game. The lesser known stars of the team came through this time, Greg Dobbs raised his stock price with a nice game he had. The first exhibition game against the Florida State Seminoles was cancelled due to rain on the previous day, but the Phil's Spring Training schedule is underway. 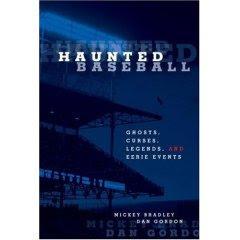 Join us tonight for author, Dan Gordon who along with his co-author Mickey Bradley authored a book on ghosts in baseball. Modern stories of players who have seen or believe in ghosts. It should be interesting to talk to Dan because the book is really great. Join us right here on our site at 6:45pm at www.phillywebcast.com to listen or join into the show.